This recipe is my stand-by. It so good, and it always comes out so well. 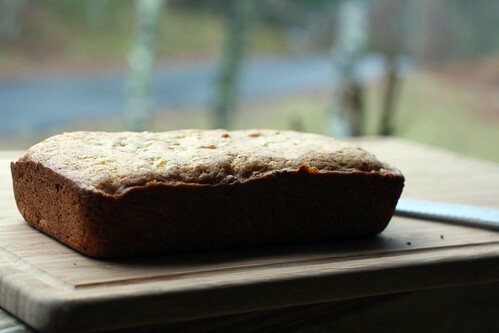 It's just your basic banana bread recipe, but it tastes so homey and just makes you happy. Does anyone else equate tastes and smells to places and feelings? I'm sure we all do it. For me, this is what home should smell like. I made this loaf for a friend. 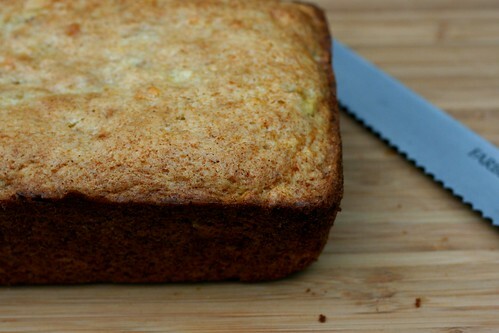 Mix butter into mashed bananas, add sugar, egg and vanilla. Add flour last. Mix well. Pour in greased loaf pan. Bake at 350 for about 45 minutes. It's best with whole wheat, but I didn't have any ground. White works well too. Looks amazing! Next time you make this (if you are feeling in the mood) you could add peanut butter chips. Mmmmm!! Very lovely recipe. I definitely equate smells with memories all the time! It definitely was AMAZING. Thank you, Hannah and Sarah. hey tim, the bananas i used were just sort of..in between? haha. I use a Whisper mill. It and the NutriMill are the best. They grind the finest...which is what you'll want. Thanks for the recipe. I wanted to use some self-rising flour to make banana bread! I never thought of PB chips. I also love your photos. Oops. excuse me. They renamed "Whisper Mill" to Wonder Mill. It's worth buying these expensive mills because you will love them. Hand grinders are way way too much work to use regularly. And the kitchenaid attachment is worthless for fine flour. I've really researched these mills. Made this today. It was dead easy (and that's saying something coming from someone who burns water) and super yummy. So thanks! Hi, Hannah! I just have to say that this is my favourite BB recipe. Time and again it turns out perfectly and its so delicious! Good one!